Does Red Clover Cause Infertility in Sheep? Let the Cattle do the Work! Jennifer Phillips’ love affair with grazing animals, and her subsequent farming career, began when she acquired a few lambs to mow her then two-acre yard. In 2001, after two decades in New York City she had just moved to Stuyvesant, in northern Columbia County, NY, to take a faculty position at Bard College’s Center for Environmental Policy. Today, the part-time assistant professor of environmental science produces grass-fed meats in the sleepy town of Clermont, where she owns Gansvoort Farm. Jennifer’s animals – a flock of 55 ewes and their 100-plus lambs plus a dozen Red Devon cattle — spend their entire lives outdoors, even in the winter. For most of the year, they graze on a diverse mixture of pasture plants, including orchard grass, perennial rye, meadow brome, timothy, white, red and alsike clovers, birdsfoot trefoil, alfalfa and chicory. When the pasture runs out in winter and during severe drought, they receive hay. Grain and other concentrates have no place in their diet. At one-day intervals, Jennifer moves each group of animals to a fresh paddock using portable electric fencing — netting for sheep, and a strand of wire for cows. She gauges the size of these temporary paddocks to allow the animals to eat the plants down to about 3 or 4 inches in height. Each patch of pasture gets at least a three-week rest to allow grasses and legumes to recover and re-grow before being grazed again. With management intensive grazing she is increasing the carrying capacity of her 60 acres of pasture every year. By comparison, where pasture is grazed continuously, even for periods as short as a week or two, preferred plant species tend to get depleted. In their place, undesirable plants like thistle, burdock or multiflora rose often take hold. And animals’ constant nibbling and trampling may expose bare ground, setting the stage for soil erosion. Jennifer said her weak link lies with marketing. Until now, Jennifer has been selling her lambs directly to individual customers as whole or half animals, with a few carcasses going to chefs. Her lambs are ready from late September to early December. She distributes the meat from a cold storage facility five miles up the road where she rents space. Most of her animals are butchered and cut to order at a tiny state-inspected custom slaughterhouse operated by another farmer in the fall and winter. With such a “super small” facility, she can have confidence of getting back the meat from her own animals. “I like the fact that he’s not killing animals 24-7,” Jennifer said. Jennifer attracts new customers with a bright yellow sign at the foot of her driveway and an EatWild.com listing, which draws “tons of traffic” to 100 percent grass-fed producers. Even so, with her growing flock, she was unsure how she would sell all of her lamb. She got “lucky” when another farmer told her of a family-owned business in New York seeking a local source of wool and pelts. Farmers with larger flocks have been turning to hair sheep because the wool pool price was so low, Jennifer noted. The husband-and-wife team owns Marlowe and Daughters, an artisan butcher shop, as well as two farm-to-table restaurants and a boutique hotel. Last year they bought all her wool. Jennifer sells the wool to a NYC business that has it made into sweaters. This year besides buying her wool and pelts, they arranged to receive regular deliveries of whole lamb for meat this fall. They add value to the wool with attractive handcrafted products, such as knitted sweaters and felted vests. Jennifer was astonished when they encouraged her to raise her prices. Previously Jennifer had gotten woolen comforters made, which were slow to sell. Now with an eager, discerning buyer, she considers wool in her breeding decisions. She also abandoned her goal of an all-white flock since she is well compensated for colored pelts. By lambing later and on pasture, Jennifer has been able to take a laissez-faire approach to lambing, without fear of significant losses. 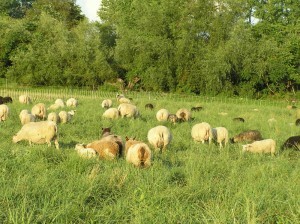 In 2012, from April 26 until mid-May, the 55 ewes of Gansvoort Farm gave birth to 115 lambs. Only two lambs didn’t survive. Jennifer believes her pasture system is more conducive to successful lambing because the animals have space to get away from the flock and give birth without interruption. Rigorous selection process has also paid off. “If you select very stringently for characteristics like good health and reproductive success, rather than relying on drugs or a lot of handholding, you end up with a flock that is more or less maintenance-free and requires less labor,” she said. At the end of every January, she culls the flock based on her records. Ewes that had worm problems, lambing difficulties or mastitis go to the butcher. These days, she usually culls only three or four animals annually. Besides lambing on pasture in mid-spring, Jennifer follows other practices endorsed by the organization Animal Welfare Approved. She doesn’t dock tails on sheep or cows, and she always provides fresh water in every paddock. On any day when the temperature will exceed 75 she provides them with pasture that has shade. She’s also planting more shade trees around the farm. Jennifer vehemently disagrees with the practice of killing coyotes. Though she hears coyotes every night, she has never had a problem with them. “I have a theory that the coyote you know is better that the coyote you don’t,” she said. Not all coyotes attack livestock. Pups learn to hunt and what to eat from their mothers and other elders in the pack. When resident coyotes are killed, Jennifer says, the ones that move in to replace them may be more aggressive. Keeping a high-voltage charge in her portable electric fence has been a sufficient deterrent. She takes care though never to leave an un-electrified fence upright. Jennifer started out with Finn Dorset crosses but the 140-pound ewes were a little big for her to easily handle. Many also had long tails and she doesn’t dock. Today her flock is predominantly Icelandic. She chose the breed for its extreme hardiness and ability to grow well on grass. They also have short tails and are known for their delicious meat and exceptional wool. They have a coarse outer coat that sheds rain and snow and a very fine, soft undercoat once prized for undergarments. In a typical year, Jennifer only has to worm about 5 percent of her sheep. “There’s a big environmental cost to using chemical wormers,” she said. “They kill dung beetles and all kinds of other things. Also, repeated use of wormers causes parasites to develop resistance so when you really need a wormer, it’s not effective.” Instead she employs other strategies to reduce worms, such as seeding chicory, which is high in condensed tannins. These compounds are known to reduce worms in sheep. Eight years ago, Jennifer added Red Devon cattle to her farm. The two types of livestock play host to different worm species. 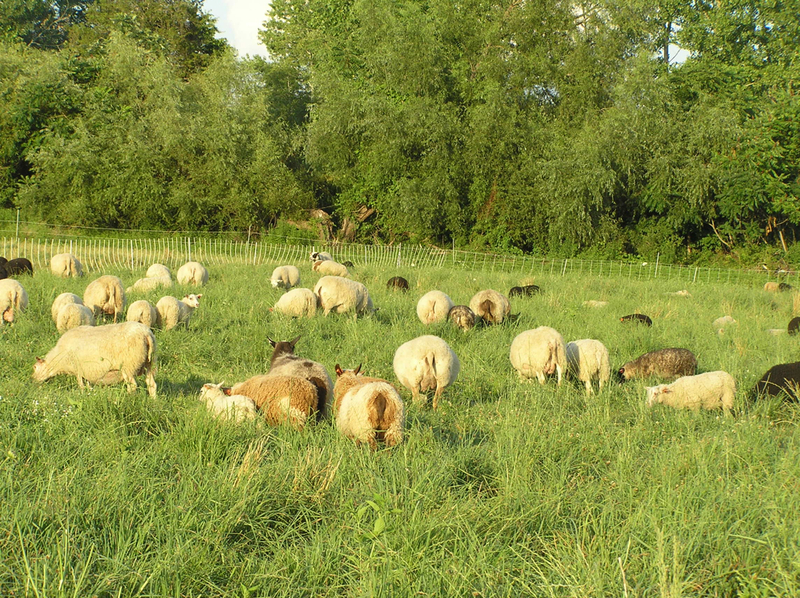 By grazing cattle after sheep in her pastures, she aimed to significantly reduce the worm load. But she hasn’t been able to make the small herd profitable. Selling the cattle should enable her to extend the grazing season for her sheep so she won’t have to feed hay until January. Tracy Frisch is a homesteader, writer and community activist in Argyle, New York. 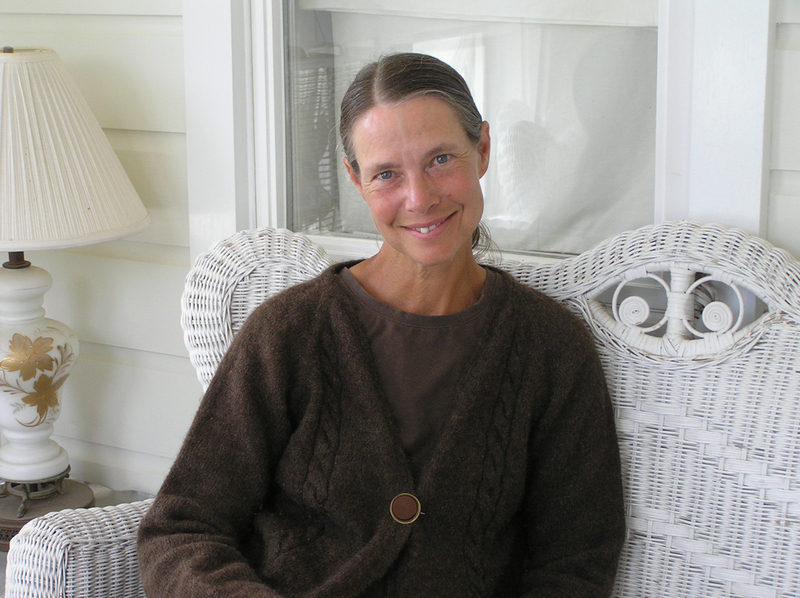 She served as the founding director of the Regional Farm & Food Project from 1996 through 2004. A longer version of this article appeared in the September 2012 issue of Hill Country Observer.